Enzo was a champ nurser and a champ eater. At 6 months he started eating solids and loved it. 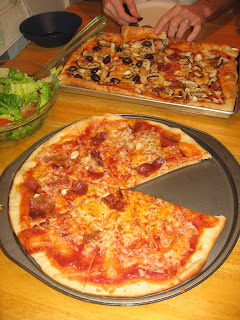 At that time I was a stay at home mom who used all of his nap time to cook. Back then he took two naps. The first nap was dedicated toEnzo food and the second nap was dedicated to grown up food. Enzo's food consisted of mashed veggies, rice, beans, tofu, flax seed, and pretty much anything that I thought was healthy. I would make a big pot and puree it and he would love it. I would also freeze the puree in it in little ice cube trays. I would then take the ice cubes put it in a zip lock bag and label it. 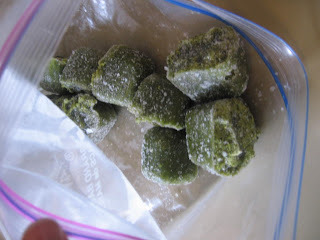 This whole system of freezing in ice cube trays started when we had access to insane amounts of basil and made more pesto then we could eat before it would go bad. It turned out to also be a great system for baby food because the portions are small. This way I didn't have to cook every single day and he didn't have to eat the same mush three days in row. As soon as he went to one nap the cooking ordeal became a lot more difficult. I was absolutely paranoid about having him in the kitchen. I was scared he would hurt himself with hot water, hot pots, knifes, getting his fingers shut in the fridge door, opening the oven, and so on.Enzo wanted to be with me, I wanted to be in the kitchen, so we were going to have to make some adjustments. I tried my best to move the dangerous things out of his reach but mostimportantly I tried to relax. Another thing that happened was that Enzo began to have more opinions about the food we gave him and was no longer eager to eat butternut squash with tofu and beans. Again another adjustment needed to be made. So now that he's taking a nap and I am thinking about what to feed him when he wakes up I decided to share some of my experiences with cooking for him and with him. I carried him around in a sling a lot and used a sling in the kitchen. I DO NOT recommend this. I realized how dangerous it was. I was close to the stove so consequently he was close to the stove. I was cutting veggies at the cutting board and his little fingers were right there. 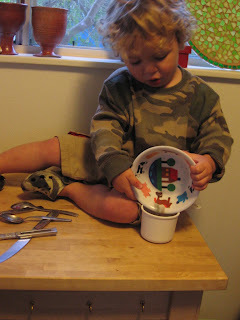 I moved him to a high chair where he could still see me and I would give him a pot and spoon to play with. It was also at this time that I started to always play music in the kitchen. It would relax me and remind me that this was supposed to be fun. I don't want to push any products on you but there were a couple things that made cooking for him so much easier. The first is this. 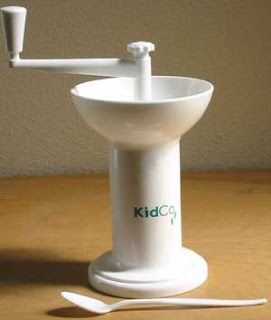 This is called a baby food mill or baby food grinder. I seriously used this every single day for months! I can not stress how much I love this little gadget. It works great and is very easy to clean up. If you have a food processor you can use that to puree the food, however some people claim that food grinders and blenders take important vitamins away from food. I don't know if that is true and if I had had a food grinder at the time I probably would of used this. If you don't have one this is cheap and very useful. the second indispensable item that I used was this book. 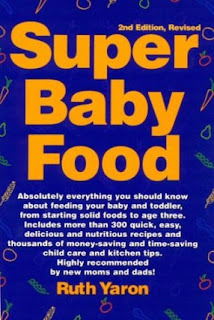 It explains step by step how you can make your own baby food. It is WAY cheaper and WAY healthier than buying jars of baby food. Plus all those little jars are totally disturbing to the environment. If you buy jars of baby food I really recommend making your own. It is not as time consuming as you think and it really is much healthier for you kid. It is well worth the sacrifice. 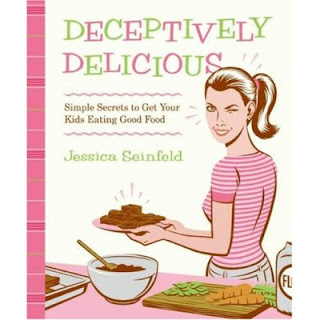 I still use this book because it has recipes fortoddler finger food and other great nutritional information. I suggest checking it out of your library or buying a used copy. Better yet, if you live in Santa Cruz area I can let you borrow mine. Enzo decides that finger food is fun and mainly wants to feed himself but will still let us feed him. The hard thing about this age was that Enzo would (he still does this) go into phases of eating like a truck diver and then eating nothing. It drove me crazy. This was emotionally very hard for me. I would get extremely worried when he didn't eat anything and so happy when he did that I would try to stuff food on him all day long. When he ate he didn't mind being stuffed with food but when he didn't want to eat it made our relationship hard because I was nagging him all day long and I seriously felt like a bad mom, like I was starving my child. 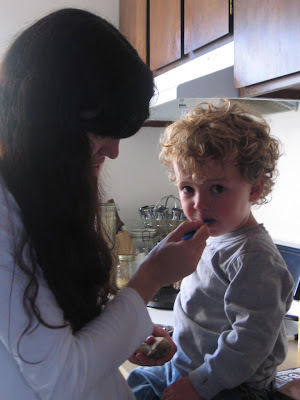 After taking him to the doctor on several occasions I was assured me that this behavior is normal.Enzo was gaining weight, his body was changing and he was not starving himself. So, if you are now in this phase my advice is to relax and talk about it with other parents. 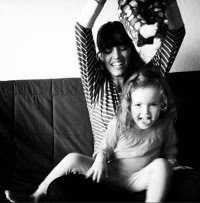 I would e-mail my friend constantly so she could support me with stories about how her daughter also refused to eat. Enzo will be two in the end of this month and I have never had this much fun with him. He wants to do everything we do except eat his veggies. My previous experience about obsessing whether he ate or not taught me to notobsess about him not wanting to eat vegetables . I have taken a different approach. First I think it's crucial for him to see us eating together. So we always have dinner together and I make vegetables and the mostimportant thing is that I want him to see Christian and I eating healthy. He wants to serve himself so we let him always put some on his plate even if he doesn't eat it. Usually as soon as he puts that broccoli in his mouth he screams "ca ca" and will either put it back on his plate or throw it as far away as possible. We just go on with our dinner and hope that one day he'll like his broccoli. Christian's cousin has lots of kids and she's developed this really cool thing called the "no thank you food". She expects her kids to try a little of everything and they can pick 1 thing on their plate that they don't want and can say "no thank you" to. 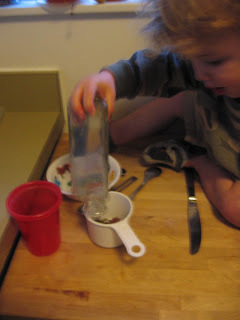 I this this system is great but Until then Icontinue to make little ice cubes broccoli puree and other vegetable and will just mix it in with his beans, or something I know he likes, and he's happy that he didn't eat the broccoli on his plate and I'm happy because in reality he DID eat broccoli but it was mixed in with something else and he never new. Here is evidence that sneaking veggies in your kids food works. there is this new book that teaches you how to make recipes that your kids will want to eat but that also has veggies. It's by JerrySienfield's wife Jessica Sienfield . I'm only stating this because I think she got this thing published more for popularity then because it's that useful. Don't get me wrong it's a fun book with EASY recipes and great pictures but the concept is totally basic. Preheat the oven to 350°. Coat a 9-inch baking pan with cooking spray. In a large mixing bowl or the bowl of an electric mixer, beat the brown sugar with the oil or margarine until creamy. Add the whole egg and egg whites one at a time, beating well after each addition. Beat in the melted chocolate, beet puree, buttermilk and vanilla. 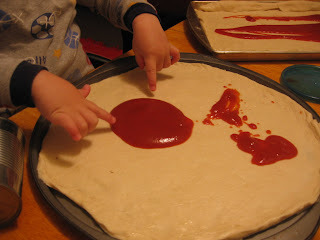 Add the flour, baking soda and salt, and beat until smooth. Pour the batter into the pan and bake until a toothpick comes out clean when inserted into the center, 35 to 40 minutes. Let the cake cool 5 minutes in pan before turning out onto a rack to cool completely. Meanwhile, make the frosting. Beat the cream cheese with the confectioners' sugar, cocoa powder and vanilla until smooth. Slice the cake in half horizontally. 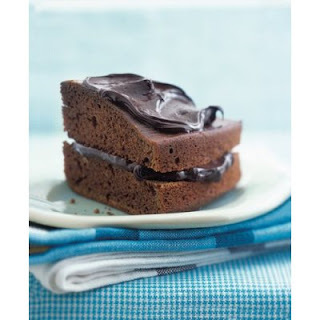 Spread the frosting over the top and between layers of the cooled cake. My favorite these days is cheese with eggplant .If you put the veggies on top of the cheese then the veggies get crisp and not the mushy soggy texture we all hate. Dissolve the dry yeast in the warm water. Mix all ingredients together. Let raise 5 minutes before rolling out. 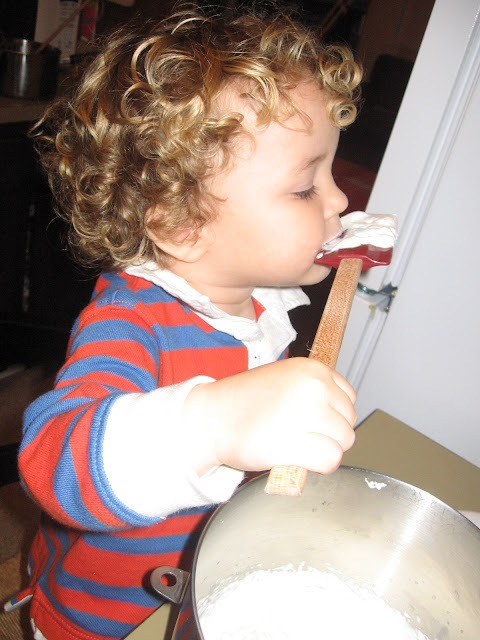 Cooking with toddlers can be frustrating for sure but it can also be really rewarding especially when they realize that they helped, it makes them want to eat what they made. There are times where I have no time and can't really give Enzo the attention he needs while I cook to make sure he can help and also be safe. However, if he still really wants to be in the kitchen then I give him his own project. His favorite is making stone soup. I tell him that mommy needs to cook alone and it's his time to cook alone. This took some persuasion but he is starting to understand and ends up having a good time and giving me a good 15 miutes where I can finish dinner. 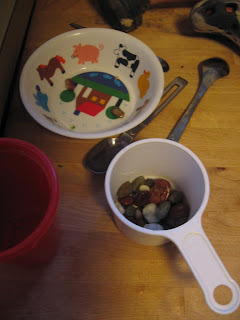 He makes very yummy stone soup, he said it was o.k to share his secret recipe. You can thank him later. don't throw rocks at mommy while she cooks. This makes her mad. don't put any rocks in your mouth this results in an instant "all done". So cute!! I am dying that you're not going to be in Santa Cruz- I loved talking with you the other day and I'm really going to have to get to SC while you're there. We always had "no thank you" helpings when I was growing up- if you didn't want to eat something, you had to at least take a "no thank you" helping and eat that. It might have been one broccoli floret, or three green beans, but you had to have at least a little of everything served.